Ballot numbers coming out of Fulton County, Georgia revealed that a disturbing number of the provisional ballots submitted in what’s considered to be a Democrat stronghold were rejected for being duplicates of ballots already tabulated by election official, according to several conservative and law enforcement observers of the 2018 mid-term elections. As a result of mistakes and lack of proper supervision, the Democratic candidate for the House of Representatives Stacey Abrams and her campaign staffers are running an entire campaign-style operation with phone banking, texts and email blasts to reach out to people who allegedly cast provisional ballots on Election Day. Abrams’ search for provisional ballots that can be counted in this election will prove futile since they contain errors and other irregularities. Why? A full 1,811 provisional ballots in liberal-left Fulton County were duplicates (49 percent), and 1,556 of them (42 percent of the total provisional ones) were rejected. Three of the individuals weren’t U.S. citizens, 581 were not registered to vote, and 972 did not live in that county, according to the latest figures released by the elections board. 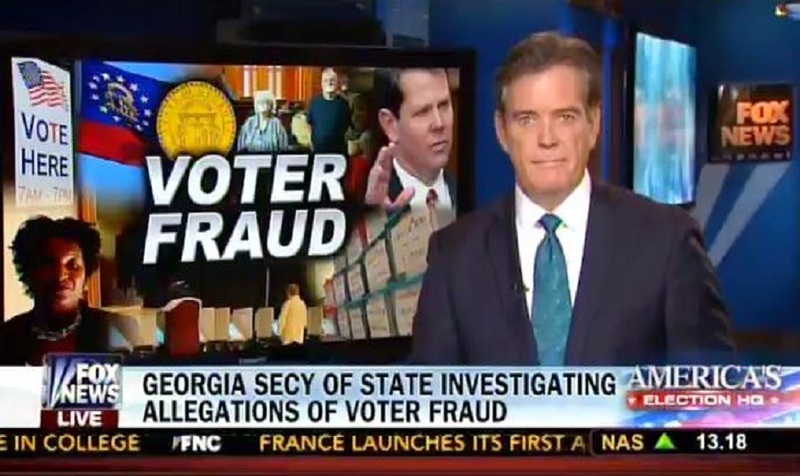 As a result, American citizens are pouring into the County Election Board Office in Georgia demanding that the Democrats and the Democrat-dominated elections officials “Stop The Fraud” that is threatening to turn the Peach State’s election process into absolute chaos. Republican Brian Kemp, the declared winner of the governor’s race, has begun his transition to office as Governor-Elect, but the Stacey Abrams campaign and the Georgia Democrats are running a persistent effort to prolong provisional vote-counting in some counties, despite no statistical possibility of an Abrams win or recount. The Democrats are using phone banking, emails, texts, and even a campaign-style ad to find provisional ballots that were allegedly disenfranchised, although many Georgia ballots were rejected for reasons including non-citizens voting and non-registered persons voting. “There are a number of the concerned citizen voters — as apposed to the non-citizen lawbreakers, deceased Democrats and voters from other states — making their voices heard as the election board hearing begins its session. The American patriots are running circles around the rival Democrats, showing up to the board office at 1 PM while the left-wingers try to throw together some signs and grab some seats by 2 PM,” said Mr. Ling. “Unfortunately, most of the news outlets are in the bag for the Democrats, whose version of events is being sold to the public as unbiased news,” said former political strategist Michael Barker.